Bio — Nick DePetro, Esq. Nick DePetro was born and raised in Denver, Colorado. Nick earned his undergraduate degree from the University of Southern California, and attended law school at Creighton University School of Law. After law school, Nick worked as an Assistant Public Defender for the Douglas County Public Defender’s Office in Omaha, Nebraska. During his time as a P.D., he defended clients charged with a range of felony, misdemeanor, and traffic offenses. These matters involved trials spanning everything from speeding tickets to 1st Degree Murder charges. 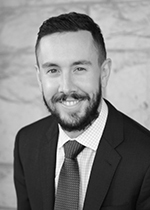 Nick returned home to Colorado in late 2014 to work for the newly established Office of the Municipal Public Defender for the City of Denver, defending disadvantaged clients in criminal jury trials, court trials, and probation revocation matters under the Denver City Code. In order to broaden his expertise and knowledge of civil litigation, Nick later entered private practice and gained extensive experience in complex civil litigation while working in insurance defense for two years before starting his own law firm. Nick's practice focuses on the representation of people being investigated or charged with crimes of all types, family law matters (including divorce, custody and child support), and also general civil litigation. Nick believes strongly in providing outstanding legal representation through a client-centered approach customized to achieve his client’s stated goals. He routinely appears in traffic, county, and district courts across Colorado, as well as the Federal District Court for the District of Colorado.